The transformation of printing from handcraft to an industry began in 1812. Koenig and Bauer—through the application of iron, steam power and, above all, the cylinder—replaced the wood construction, hand power and screw mechanism of the Gutenberg press that had existed for the previous 370 years. While these changes dramatically increased productivity, the industrialization of print machinery remained incomplete. Mechanical limitations, the consistency of paper manufacture and print quality issues prevented the cylinder press from reaching speeds greater than a few thousand sheets per hour. By mid-century, the demands of publishers for faster and larger print production volumes required another technological leap. 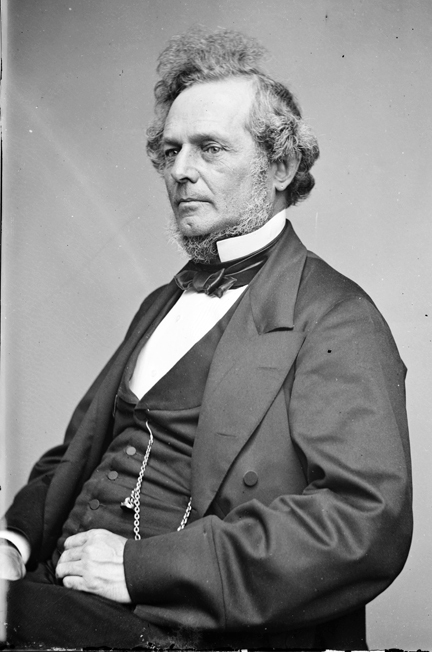 In 1847, Richard March Hoe provided the solution with his invention of the first rotary printing press. When reviewing the evolution of the press, an understanding of print fundamentals is important. With the exception of modern-day digital systems—where an infinitely variable image is rendered directly to the substrate by print heads—all previous printing machinery had an important common feature: an image carrier. The image carrier is the surface from which ink is transferred to paper or other print material. In letterpress printing, the image carrier is the raised metal type form. The letterpress process also requires an impression surface where pressure is applied tp transfer the ink to paper. During the industrialization of printing, both the image carrier and the impression surface were converted from a flat platen shape to a curved rotary shape. 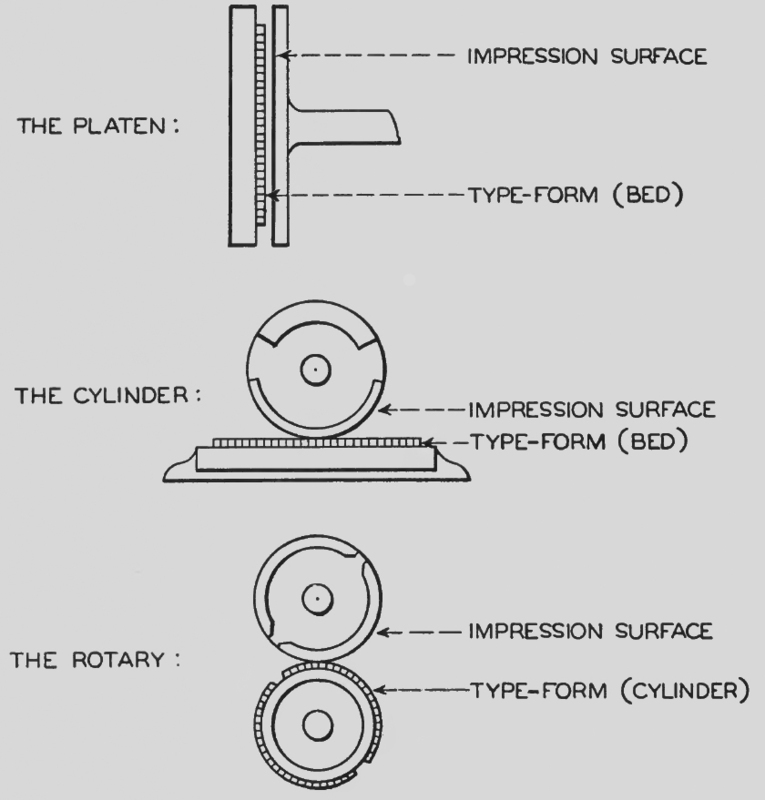 The illustration below shows how the cylinder press was a transitional or hybrid development between the platen press and the rotary press. With the cylinder press, the image carrier remained flat, while the impression surface was curved. The ink was applied to the paper as it rode on the bed underneath the impression cylinder. It took another 35 years of experience and experimentation before the type forms could be mounted on a curved surface and the paper could move on its own between the impression and the “revolving-type” cylinders. This is the core achievement of the rotary press identified with Richard March Hoe. There were many individuals and companies that worked on creating a rotary printing machine that did away with the platen type form bed. As far back as 1790, an Englishman name William Nicholson took out a patent for a system that designed letter forms around a cylinder. However, the idea was never delivered practically. The story of the first commercially successful rotary press is the story of the Hoe family. Robert Hoe (1784-1833) was born in Leicestershire, England. With skills as a carpenter, he emigrated to the United States at age eighteen. He later formed with his brothers-in-law Peter and Matthew Smith a wooden press-manufacturing firm in New York City. In 1823, he gained sole ownership and the R. Hoe & Company was founded and it became the first company to build an iron and steam driven cylinder press in America based upon the designs of Koenig and Bauer. After Robert Hoe’s death in 1833, his sons Richard March Hoe and Robert Hoe II took over the business. More than any other firm, the R. Hoe & Company expressed the fact that, during the two decades between 1830 and 1850, the center of printing technology development had shifted from Europe to America. With its six-and-a-half foot diameter central revolving type cylinder, these new machines were rapidly adopted across the US and also in Britain. 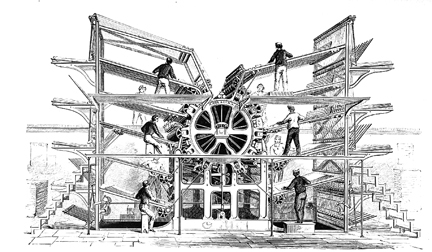 In 1858, The Times of London ordered two ten cylinder presses to replace the Applegath vertical press that had previously been in use. R. Hoe & Company also built two, four, six and eight cylinder systems to accommodate the different needs of newspaper publishers. The challenges that remained to be solved were developing a rotary press capable of printing on both sides (perfecting) and from a roll (web) of paper. These issues would be conquered after the Civil War and R. Hoe & Company would play a role—along with other important figures—in their development. This will be the subject of the third and final part of this series. This entry was posted on April 19, 2012 at 1:23 pm and is filed under People in Media History, Print Media with tags cylinder press, Richard March Hoe, rotary press, type-revolving press. You can follow any responses to this entry through the RSS 2.0 feed. You can leave a response, or trackback from your own site.